In the previous article we started to see how you can differentiate modes from each other. And we'll keep on doing the same today. As you saw before, what distinguishes modes is their tonic (yes, the same tonic that defines a key), associated to a characteristic note which I called a natural characteristic degree (NCD). To eventually simplify things, you can resort to "parallel modes." "Is this a joke? You are talking about simplifying things and you throw around yet another abstruse term? " Don't worry, I'm talking basically about the same principle behind the parallel scales you saw in article 16 of this series, but in this case it's modes that begin with the same tonic. It's easy to observe that the alterations correspond to those of the original scale of each of the modes presented here, for instance Bb-Eb for the Bb major scale of C Dorian. However, this begs the question of the key signature of a song written in modal harmony. Should you adopt that of the original scale or should you take a particular key signature and add and remove alterations depending on your needs? The answer is not clear-cut. Indicating a key signature allows you to establish a tonic even if that means eventually modulating to parallel modes of that tonic. Not indicating any key signature gives the composer much more freedom. 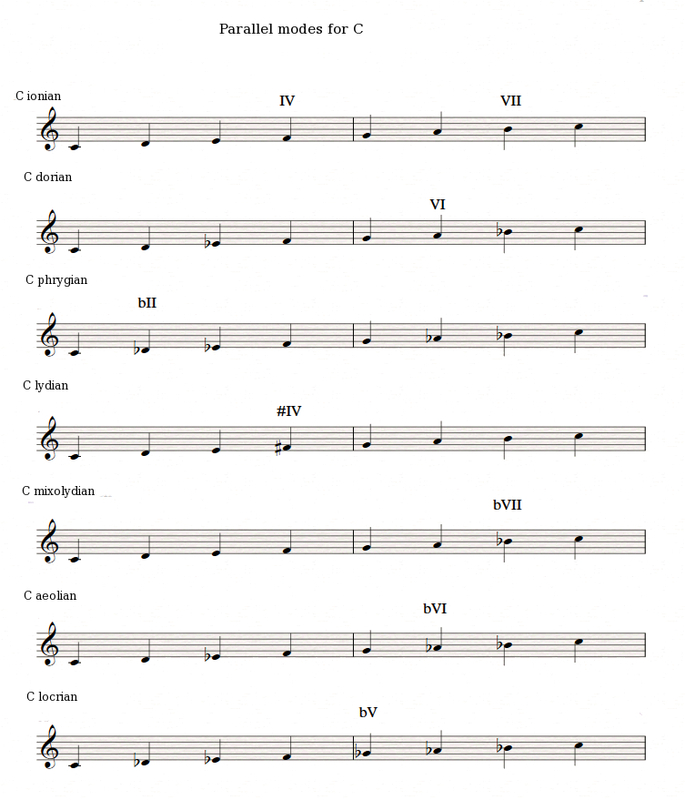 To finish, let's analyze each mode by their tetrachords. Every scale or mode based on a sequence of seven notes can be divided into two groups of four notes: one going from degrees I to IV and another one from V to VII, plus the octave. 2 semitones, 2 semitones, 1 semitone. The first two intervals form a major third, so it's considered a major tetrachord. 2 semitones, 1 semitone, 2 semitones. The first two intervals form a minor third, which makes it a minor tetrachord. This way you can define modes by their tetrachords. However, the phrygian and lydian modes are somewhat particular: the first one because its tetrachords start with a semitone, and the second one because its first tetrachord is an augmented fourth. This type of specific tetrachords get their name from the mode in question.